If you are interested in the environmental results program then you might want to think about the benefits of the ERP planner. Any person who works for the EPA or a related environmental organization can make use of this free ERP planner. The ERP planner will tell you just about how big or small the sample size needs to be for a single round of inspections. How is this useful? It is great for workers who always need to engage in inspections of various areas or facilities. By using the ERP planner, you will know exactly what you need to do in terms of sample size for a specific inspection. The environmental results program is very reliant on the margin of error of particular surveys. If you conduct a study but it has a huge margin of error: it means the results you get are not going to be worth much. 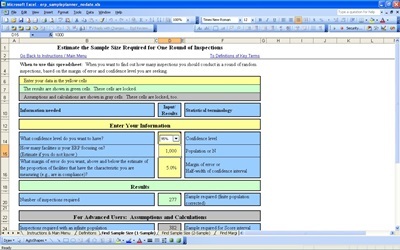 By using the planner, you can easily see what the margin of error will be based on a specific sample size. So, you can figure out what sample size you need to get a certain margin of error (5% for example). The ERP planner is so easy to use because of how it is structured. You enter the specific information pertaining to the study. You will enter the confidence level, how many facilities are there, and how many inspections will be taking place. This will tell you exactly what sample size you need. Instead of playing guesswork, simply enter the information in various ways and you will see what sample size matches up with the margin of error you want. Working for the environmental results program is no silly business, so you will need a planner like this to do your job well! The great thing about this planner is that it helps anyone who is with the environmental results program. It does not matter if you are a beginning or advanced user; there is information for all environmental results program related studies.